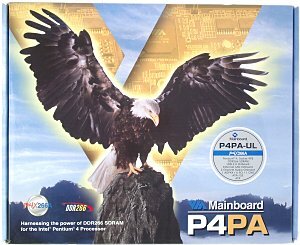 The board integrates a lot of functional elements and supports FSB 533 MHz and DDR333 memory - this is the first board on the VIA's chipsets which officially supports these innovations. We tested the preproduction sample. utility for a smart card reader. The production boards will also have a printed user manual (in English), a brief installation manual (in several languages), and a bracket for the rear computer panel because the connectors are placed untypically. The layout has usual drawbacks: audio-ins which are located in front of the PCI slots, the power connectors are placed between the board's edge with connectors for the rear computer panel and a processor's socket, and when a video card in installed it's not easy to handle the memory modules. It's not difficult to reach the only jumper even when the board is already installed. Its function is shown on the textolite. The 3-channel switching voltage regulator incorporates 10 capacitors of 1500 uF and several less capacious. The following controllers are integrated: an audio one based on the chipset's capabilities and AC'97 codec VIA VT1612A with an SPDIF connector; a network one based on the Realtek RTL8100BL; a USB 2.0 controller based on the VIA VT6202 chip. The ITE IT8705F I/O controller provides for installation of connectors for readers of smart cards. Non-unsoldered connectors: a switch of an audio controller - CNR which can be integrated on board or located on an expansion card, and a switch for BIOS protection from writing. The system monitoring is supported by the IT8705F from ITE. Processor voltage (+3.3, +5 and +12 V), speed of 3 fans and temperatures of the processor (a built-in sensor) and the board (a built-in sensor) can be controlled. There are 3 connectors for adjustable connection of fans. 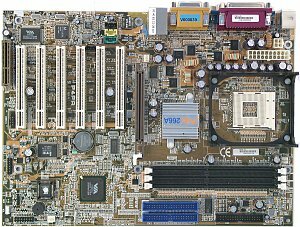 Brief characteristics of the board: memory slots - 3 DDR SDRAM; expansion slots - AGP/ 6 PCI/ CNR; I/O ports - 2 COM/ LPT/ 2 PS/2/ 4 USB 2.0; dimensions - 305õ225 mm. We used the latest available version of the BIOS - 2.21. 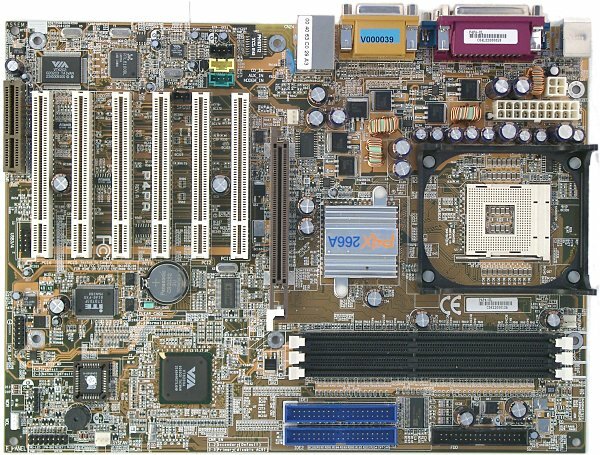 The board is rich in functional components and can be an excellent base for a powerful computer with all models of the Intel Pentium 4 processor.